A photo of LaMont Weaver during his Beloit Memorial playing days. Photo of former Beloit Memorial basketball star LaMont Weaver in 1994, the 25th anniversary of "The Shot" he made to force overtime in the Purple Knights' 1969 WIAA state tournament championship game victory over Neenah. Retired Janesville Gazette sports editor Dave Wedeward has seen the last 59 WIAA state tournaments. For years, the mirror on the wall of LaMont Weaver’s guidance office at the University of Wisconsin-Whitewater clearly reflected that you were in the right place — right up to the day he retired in 2011. It was always a place where the amiable Weaver’s everlasting smile would light up the room, and where the Beloit Memorial High School basketball legend never got tired of talking about “The Shot” that made him famous. And some things never change. Oh, the mirror now resides in Weaver’s longtime Beloit home, although maybe not in such a prominent place, but it still reflects that smile and all the memorable charm of his remarkable WIAA state basketball tournament accomplishment. Most remarkable, however, is the fact that it has been almost 45 years since Weaver, at age 16, became an instant and lifelong celebrity by sinking a 55-foot shot at the UW Field House that broke the Neenah players’ hearts and saved Beloit in the 1969 open-class state championship game. The inscription on the magical mirror, taken from a T-shirt that Weaver sold for cancer fundraising in 1993, traces the electrifying flight of the spectacular shot that made history. And the famous shooter has told the rest of the story at least a thousand times. It was March 22, 1969 — 12 days after James Earl Ray pleaded guilty to the murder of the Rev. Martin Luther King Jr., and four months before Neil Armstrong took that giant step on the moon. After finishing atop the Associated Press large-school state rankings, Beloit took a 25-0 record against upstart and hot-shooting Neenah for the 54th annual WIAA state title. Many thought the championship had been decided the night before, when Beloit downed second-ranked Kimberly 70-56 in a semifinal battle of unbeaten teams. But were those people in for a shock — or should we say shot? The palm-sweating finale was awesome — with a finish more incredible than anybody could have imagined. So amazing, in fact, that when Pat Hawley’s 10-foot jumper from the lane gave Neenah a 70-68 lead with 3 seconds left and an apparent victory, it was just the start of the pandemonium. Neenah’s huge crowd erupted in ecstasy. Beloit’s tears flowed all the way from the cheerleaders to the eyes of Weaver and beyond. “We were all down (in the dumps) … kind of distressed,” Weaver recalled. Calm and collected coach Bernie Barkin, a Beloit legend in his own right, perked up his team and set up a plan during a timeout with 2 seconds left. So much for the plan, however. Weaver followed instructions, cutting across the court from right to left and taking the inbounds pass from the baseline. But after he dribbled once to near the Beloit bench, there was no choice but to simply fire away. As the momentum generated by the left-handed fling from far beyond midcourt almost carried Weaver into Barkin’s lap, the ball took its astounding 55-foot course to the opposite end, banking off the glass and through the basket for the game-tying, two-point field goal as regulation time expired. At that point, probably nobody was more shocked than Weaver. And that’s saying a lot. Indeed, this was long before such a thing as a 3-point basket, where a shot like that might have won game today. This “miracle” shot of 1969 simply tied it, 70-70. So, yes, the historic game was going into overtime — two overtimes, in fact. AndAlmost lost in the aftermath were the two free throws Weaver made with 36 seconds left in the second overtime to give Beloit an 80-79 victory and the sixth of the school’s seven state titles. 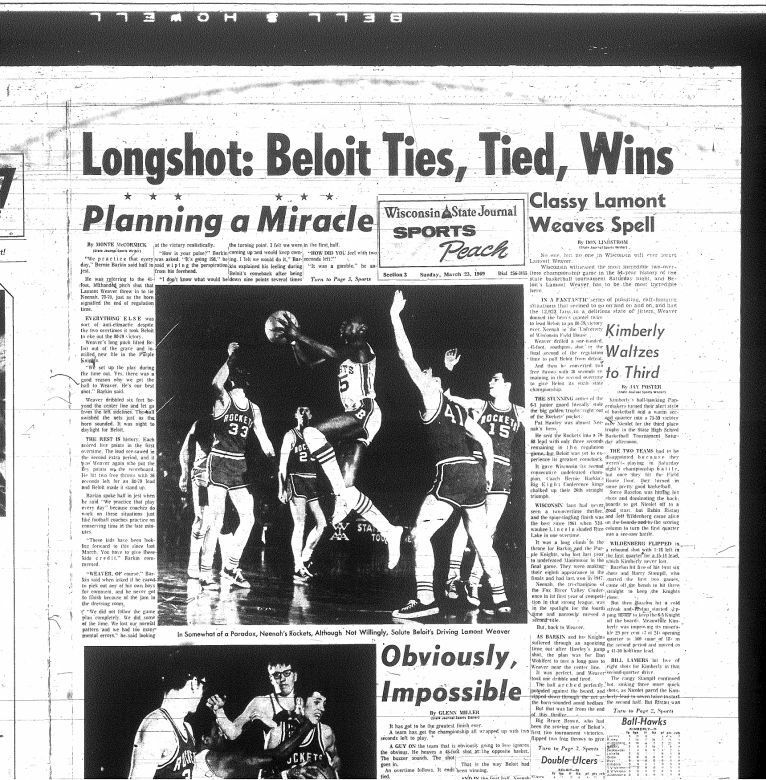 While the 1969 gold ball was one to be cherished, as shown by the estimated 15,000 who lined the Beloit streets to welcome home the Purple Knights later that night, “The Shot” is what has remained on countless minds for more than four decades. In today’s world, you’d see something so remarkable replayed time and again on ESPN’s Sports Center. Back then, you either saw it in person and or on live black-and-white TV, or you didn’t see it all. Many who saw it remember where they were, how they felt and almost everything about it. Meanwhile, LaMont has been more than happy to round out the story. Most notable may be his confirmation that it was not just typical Barkin bull in Bernie saying his team practiced that every day. “We had run a similar play in practice of a last-second shot,” LaMont said. “But it was never meant to run it all the way in. It was always that I would get the ball, throw it to Bruce Brown (the star 6-foot, 7-inch center), and he would put it into the basket. But this time, “The Shot” got in the way, leaving Weaver with his most precious memory. And the best-kept secret about it all? “I don’t know if anybody’s heard about it or not, but we just had a really good team,” said Weaver, then a 6-1 junior. “We were big, we were quick, we had a great bench and a great coach, and we all knew our roles. Ever since that night, though, long shots have been part of Weaver’s life. Almost as remarkable as the first time, Weaver stunned a lot of folks by sinking the same shot when challenged on a 1970 recruiting trip to Kansas State before settling in as a Wisconsin Badger. And a long-shooting Weaver struck again just days before the 40th anniversary celebration of his LaMont’s historic feat. That night, in 2009, LaMont’s son, Kyle, nailed a halfcourt shot for the NBA's Oklahoma City Thunder. At age 61, “Dad” isn’t likely to do it again. There have been other pains in Weaver’s life, too, like the minor rear-end automobile accident in 1986 that led to a swollen neck and the discovery that he had thyroid cancer. An operation followed, and he has been cancer-free since. Before that, he learned more than a few lessons about life as head basketball coach at UW-River Falls, where the experience went beyond having Beloit Memorial’s 40-game win streak broken and the Knights being knocked out of the 1970 sectional tournament by Madison West in Weaver’s senior year. Things picked up dramatically, though, when Weaver joined the UW-Whitewater staff in 1980 and spent 14 years — including two NCAA Division III national championships — coaching under Dave Vander Meulen. Naturally, the two talked about “The Shot” hundreds of times. After a difficult run as head coach at UW-River Falls and a long career as an assistant at UW-Whitewater, Weaver has been away from coaching since 1994. But he continued through the rest of his full-time career at UW-Whitewater, talking seriously with students as a counselor. And he has stayed close to basketball, particularly in following his son’s pro career that now has taken Kyle to Italy.LaMont now has plans to pursue a project to help homeless high school students in Beloit and Janesville. While “The Shot” obviously has had an impact, Weaver doesn’t think it ever affected the course of his life. Weaver has gone places, however, that he never imagined. One was a trip long ago with his family to Wisconsin Rapids to meet a man who had requested a visit from the young man who had made state basketball history. But celebrity status never went to Weaver’s head. His father, Robert, saw to that. But he didn't miss this one. And with Weaver's videotape of that memorable night secured in a safety deposit box, the legend lives on.It’s often on the tips of people’s tongues this time of year — particularly in years when Beloit is back in the state tournament, a feat the Purple Knights have achieved 26 times, including Kyle Weaver’s senior season of 2004. “I thought maybe after 40-some years, it might be a 75-foot shot. But it’s still 55, and I always love talking about it,” LaMont said. With that equally famous smile, of course — sometimes still reflecting off that magical mirror. It was 1955 when Dave Wedeward first attended a WIAA state boys basketball tournament game. At the time, he was a sixth-grader growing up in Edgerton. When "Weedy" takes his seat in the Kohl Center stands today, it will mark the 60th consecutive state tournament he has witnessed in person. Wedeward was on duty for most of those tournaments. He spent 46 years with the Janesville Gazette — 39 of them as sports editor — before retiring in 2011, at age 68. For half a century, coaches, athletes and colleagues have marveled at Wedeward's ability to remember the most minute details of the thousands of events he covered — and, more importantly, the personalities of the people who brought those stories to life. "Almost everybody has special memories of the state tournament. I think I have a special memory of almost every one of them, but some rank above others," Wedeward said. One of them was "The Shot Heard 'Round the State," the buzzer-beating, game-tying basket by Beloit Memorial's LaMont Weaver recounted here, in a story that appeared originally in the Gazette. "Ten years later, Tom Mitchell and Keith Burington led top-ranked Monroe to a 26-0 season and the 1965 open-class state championship with a 74-71 win over Eau Claire Memorial." 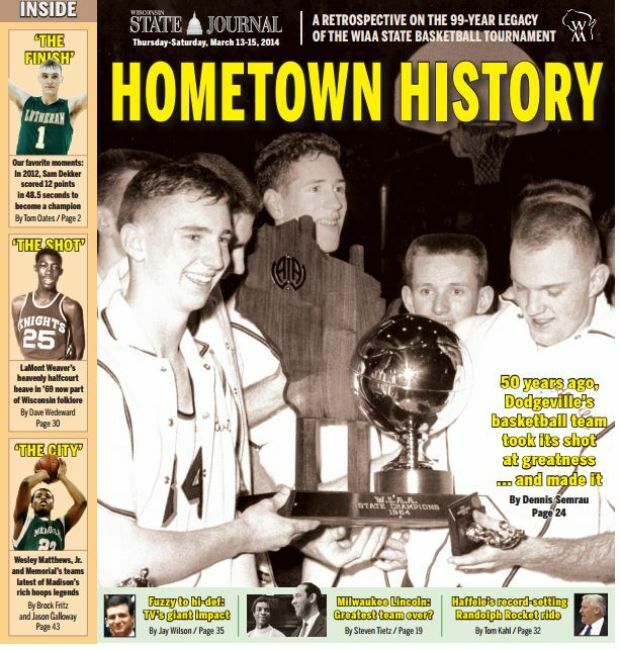 Coming Thursday: Our 48-page special section celebrating the history of the WIAA state boys basketball tournament, which begins Thursday at the Kohl Center. Look for it in your Thursday edition of the Wisconsin State Journal or pick up a copy at news stands throughout southern Wisconsin.